Reading: Since the 2012 Olympic Games have kicked off, I had to put that in here somewhere! This article from The Salt about the calorie consumption and diet habits of Olympians. Fascinating statistics indeed! Listening to: Rain by Madonna. It has been raining all week, and this is one of my all-time favourite Madonna songs. I think she looks her best here. Confessing: Since we are talking about silent films and sync sound, I must tell you, when I was little, I used to read the end credits of every movie I watched, religiously. And I thought that a ‘boom operator’ was someone who supervised explosions on set, if any. Later, I learnt from my father that a boom operator was a technician who handled boom mics. Loving: This Melie Bianco gourmet carrier. Gourmet carrier sounds so phancy and so much nicer than lunch bag!! 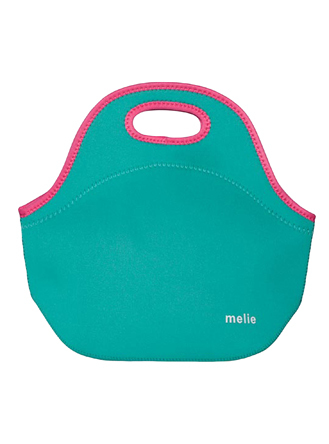 Available in this season’s trendiest colours, this is a colourful, sleek and fun way to carry your lunch! « Peanut Butter Poppers. You Can’t Stop At Just One. And Yes, They Are Better Than Pringles. Love that story about the boom operator – hehe! I always used to read the credits too – I wonder why?! I am definitely not a Madonna fan, but I remember getting TV Hits back in the day and each week (fortnight? whatever…) it came with four song lyric cards on the back. When Rain came out, that was one of them, so I sang along at any opportunity, lyric card in hand! haha! Oh how I miss lyric cards and old Sony tapes with lyrics on the flap. I realized my son won’t even understand what a tape is when I show him a picture! And I think reading credits shows that we pay attention to detail and that we appreciate all aspects of film. I’m going to start calling my lunchbox a gourmet carrier. I bet my boys will love that. Hahaha. That IS adorable! Yeah! Just call it that. All of the things you make are rather gourmand-y anyway, so your kids can have the best gourmet boxes in school!! Maya has a similar lunch box and I love it because it’s washable! Oh how nice! I used to have a hot pink nylon material ‘brown paper bag’ style lunch bag. It would still be trendy today! Sadly, I did not save it. Oh well. You just made a comment (after my comment) about giving up some computer time. Hahaha!! Thanks so much for visiting! Lol. Well, right now both the bebe and the hubby are napping, so I don;t feel guilty. The online world can be really addictive…and sometimes I know I should shut down and walk away. But the good part is getting to meet new people like this!! Ooh yes, The Birds still gives me the chills! This one is quite the opposite though. Not scary at all! !